This new condo project featuring two brand-new condominium towers and the redevelopment of a hotel in the Wynford-Concorde neighbourhood. Wynford Gardens Condos is a new mixed-use condominium development in North York region.Sitting just northeast of the Don Valley Parkway and Eglinton Avenue East intersection, the site for this proposal is a connected and ambitious location.In its current state, the site includes a 34-storey condominium building, along with a six-storey hotel and a six-storey seniors’ residence. 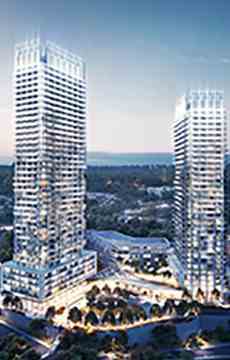 The proposal requests to add two condominium towers – standing 30 and 36 storeys – and convert the existing 353 existing hotel suites into 283 suites, which will consist of 141 hotel rooms and 142 residential units. Upon completion, the new structures will house 983 new units in total. The unit mix for the entire development will add 70 new bachelor layouts, 496 one-bedroom and 276 two-bedroom layouts to the community. 949 parking spaces – with 796 of those reserved for residents – are proposed in an underground garage, accompanied by over 500 bike spaces. The developers have applied for 15,500 square-feet of new indoor amenity space, in addition to the existing hotel amenities which condominium residents will have access to. The existing hotel amenities include conference rooms, indoor and outdoor swimming pools, fitness rooms and a yoga studio. 15,177 square-feet of new outdoor amenities are also proposed, including a lush outdoor terrace and a park bordering the new condominium towers that fronts onto Eglinton. The community will include a comprehensive pedestrian walkway network and a new walking trail adjacent to a ravine at the north end of the site, making for a green, pedestrian-friendly pocket that engages residents and visitors alike. 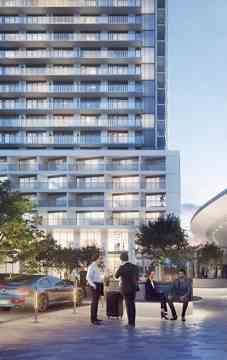 Wynford Gardens Condo project is an exciting development in North York. It sits right on the future Eglinton Crosstown line, which will add nearly 20 km of rapid transit access from Kennedy Station in Scarborough to Toronto’s Mt. Dennis neighbourhood in the west end, with 25 stops across the city. With the LRT expected to be up and running around 2020, homes around the line are expected to increase significantly in value. An accessible surface entrance for the LRT is slated for the same intersection at Wynford and Eglinton close to Don Mills. Builders : Allied Hotel Properties Inc.
Wynford GardensBuilder(s): Allied Hotel Properties Inc.